Over the course of fifteen years, Mary Ruefle delivered a lecture every six months to a group of poetry graduate students. Collected here for the first time, these lectures include "Poetry and the Moon," "Someone Reading a Book Is a Sign of Order in the World," and "Lectures I Will Never Give." 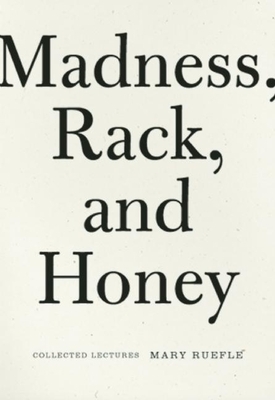 Intellectually virtuosic, instructive, and experiential, Madness, Rack, and Honey resists definition, demanding instead an utter--and utterly pleasurable--immersion. Finalist for the 2012 National Book Critics Circle Award. Mary Ruefle has published more than a dozen books of poetry, prose, and erasures. She lives in Vermont.